Even though I never depended on Transmit for my daily iPad file management needs, I was sad to read that Panic couldn't find a market for it on the App Store. 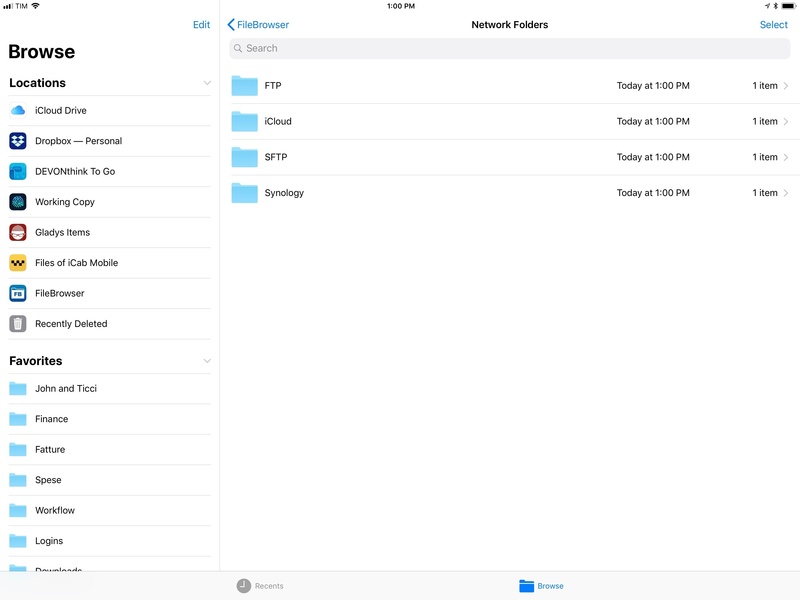 Thousands of iPad owners use Panic's app to manage their FTP servers and Amazon S3 buckets; integration with the latter is particularly important as it's hard to find apps that combine FTP access with S3 support and aren't hindered by questionable interface choices or a lack of updates. Transmit for iOS was (and, until it is removed from the App Store, still is) one of a kind. Its excellent Mac foundation was adapted to iOS with taste and elegance, leveraging a split-pane UI long before iPad users were comfortable with Apple's native Split View; thanks to Panic's penchant for beautiful and intuitive design married to power-user functionalities, the Mac-like approach worked surprisingly well on iPad too. It's difficult to pin down what, exactly, made Transmit for iOS unprofitable. The iOS counterpart always lagged behind the cloud integrations from the Mac app (Backblaze B2 and Rackspace Cloud Files, for instance, never made it to iOS); Panic didn't update Transmit to take advantage of major additions to iOS 11 such as Files and drag and drop; perhaps more importantly, Transmit for iOS is a product of the pre-iOS 11 era, back when the concepts of desktop-like file management and drag and drop were alien to the platform. Ultimately, I think Transmit for iOS lived and (slowly) died because we had it too soon. But this isn't a post-mortem for Transmit on iOS, which, according to Panic, may even relaunch as a new app on the Store someday. Instead, I'd like to take a quick tour of some of the alternatives for Transmit available on iPad today. In case Panic decides to pull Transmit from the App Store, or if the app stops working in a future release of iOS, these FTP clients and file managers should compensate for the features of Panic's app. Most of them don't offer the same sophisticated and polished UI design, but some of them may even turn out to be more flexible and better integrated with iOS than Transmit. As a new member, you'll also receive complete access to our back catalogue of over 120 newsletters starting from September 2015. Since Panic's announcement two weeks ago, I've heard from dozens of fellow iPad users who rely on Transmit for a variety of tasks – from uploading media and new posts to their static blogs, to photographers who back up hundreds of files to their private servers and folks who use Transmit as a prettier front-end for Synology's FTP access. In spite of missing some of the more advanced options from the Mac, Transmit for iOS is a powerful and versatile file transfer utility that is hard to replace for many. Integration with other server types and cloud services (e.g. WebDAV, Amazon S3, Rackspace Cloud Files, Backblaze B2). The solution to all this would be a modernized Transmit for iOS with support for all the features seen in Transmit for Mac. If you work on macOS, I highly recommend Transmit 5 (and Cyberduck, which hasn't come to iOS yet). Alas, Panic's announcement has only made things more complicated on iOS. After a couple of weeks of research and tests2, I settled on three apps that work well enough for managing FTP servers and file transfers on iPad. None of them are as good as the aforementioned Mac apps, but they have room for improvement going forward. If you're coming from Transmit, Panic's other iOS app, Coda, is an obvious replacement. 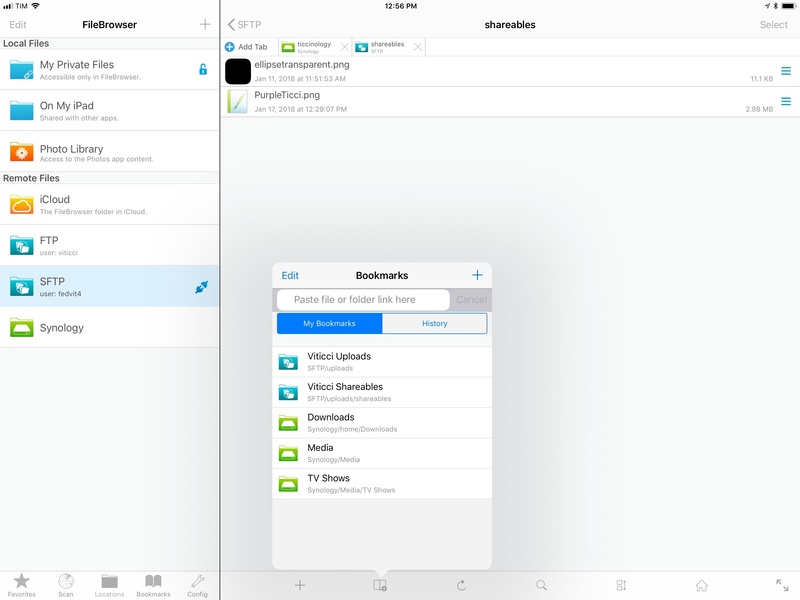 From a design and interaction standpoint, Transmit and Coda for iOS are nearly identical: both apps employ a split-pane layout for local documents and server connections, both allow you to connect to your server via FTP or SFTP, and both have a file detail view where you can act on the currently selected item. For existing Transmit users, Coda has almost no learning curve and roughly the same feature set for connecting to and managing FTP servers. Transmit (left) and Coda share the same underlying structure and design. Even though Coda is a code editor that lets you browse servers like a file manager, it can also be used as a file transfer utility (like Transmit) without ever editing any code. You can connect to FTP, SFTP, and WebDAV servers, and even log into your S3 and DreamObjects accounts, just like Transmit. You can change permissions (read/write/execute) from a file's detail view, set a remote path and root URL for FTP connections, and drag documents from the local file manager into the remote location "mounted" on the right side of the screen. The close resemblance between Transmit and Coda – to the point where Coda feels like a "deluxe" version of Transmit given the addition of code editing – might be one of the reasons why Panic decided to abandon Transmit to focus on Coda alone. Coda adopts a split-view layout for local documents and remote connections. Unfortunately, the similarity with Transmit is a double-edged sword: like its sister app, Coda hasn't been updated for iOS 11. 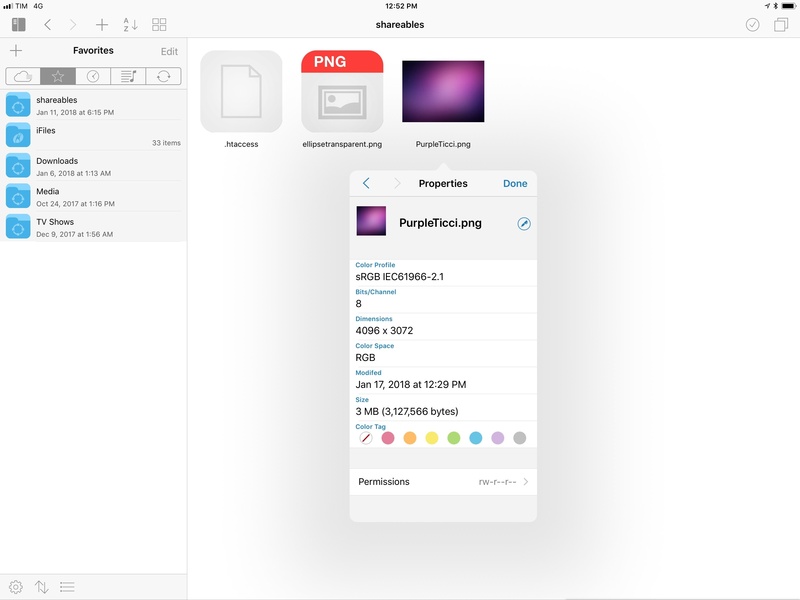 Let aside the fact that, UI-wise, Coda looks like an app that predates iOS 11 and Files, the most notable issue is the absence of inter-app drag and drop to import files into Coda and export them from a server to another app. Coda still comes with its own custom, in-app-only flavor of drag and drop, which Panic should replace with Apple's superior system behavior in iOS 11. Furthermore, sites configured in Coda do not appear as locations in the Files app because Coda doesn't come with a file provider extension like Dropbox, Gladys, or DEVONthink. The remote-based nature of Coda's locations seems ideal for Files' third-party framework, and I hope Panic is considering the ability to browse locations and view remote documents from Files. Right now, not even the basic Files picker to import documents into Coda has been fully updated for iOS 11. Coda's Files picker in iOS 11. I'm not sure what's going on with the search field, and I couldn't dismiss the picker after taking this screenshot. Despite the lack of iOS 11 updates and issues I've had with the Panic Sync feature (which hasn't been syncing locations for me at all), I like Coda for iOS because it's a more powerful version of Transmit. As you'll see below, it's rare to find an FTP client that combines great design with handy options such as the ability to copy the URL of a file uploaded to an FTP server or edit your .htaccess file without leaving the app. If Panic is going to centralize their efforts on Coda going forward, I'd like them to consider a share extension to upload files to servers (Transmit had one) and better integration with iOS 11. Coda, like Transmit, still works well, but it's showing signs of its age in key parts of the experience. 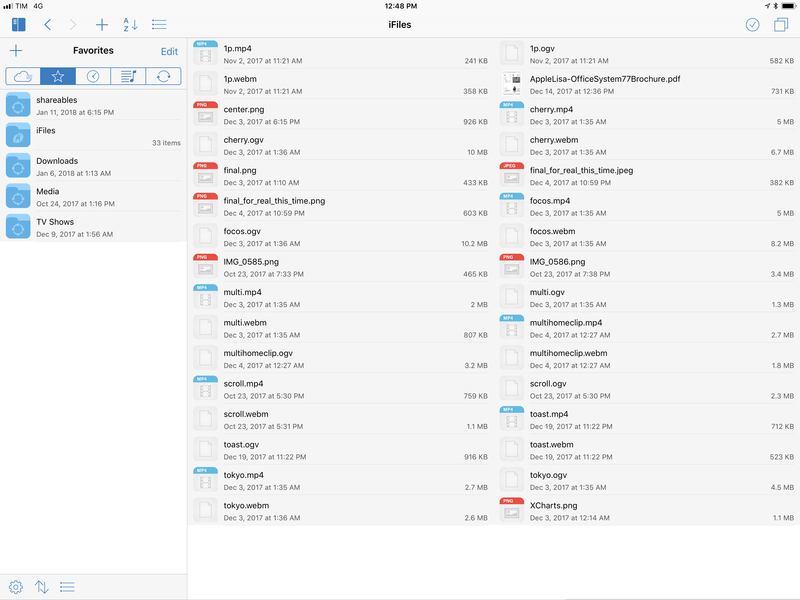 I used to manage my local and cloud documents with iFiles years ago – all the way back in 2010 and 2011, it was the only decent iOS file manager with native support for Rackspace Cloud Files (the CDN we use at MacStories). Funnily enough, several years, a couple of design languages, and a new app version later, iFiles is still the only file manager that integrates with Cloud Files. Some things never change. It's an impressive list of integrations, which, combined with iFiles' compatibility with dozens of different file formats (including .zip archives), a built-in media viewer and music player, and support for multiple tabs makes it a professional-grade alternative to simpler apps such as Documents and, arguably, Apple's Files. The difference with 2010, though, is that in the age of Files as a system-wide layer, an app like iFiles can only aspire to be a standalone file manager you use for a specific, limited purpose; in my case, that would be SFTP and Rackspace Cloud Files. iFiles 2 has a more utilitarian approach than Coda. There's a lot to like in iFiles: you can view files and folders in list or icon mode, and pinch-to-zoom to increase the size of thumbnail previews. By long-pressing an item in the file browser, you can open a contextual menu that, among other actions, lets you mark directories or files as favorites, which are collected in a dedicated view next to services in the sidebar. This action menu is also how you open the Properties panel for an item, which reveals a variety of metadata and actionable information that isn't typically exposed in more simplistic iPad apps. In addition to standard file size, modified date, and renaming options, you can change permissions for files and folders, apply tags (iFiles' own tags, not Files' native ones), and, for images, view details about bits, color space, and dimensions. Alas, can't copy an item's URL from iFiles' Properties popover for FTP uploads. iFiles' support for iOS 11 is only partial at this point. 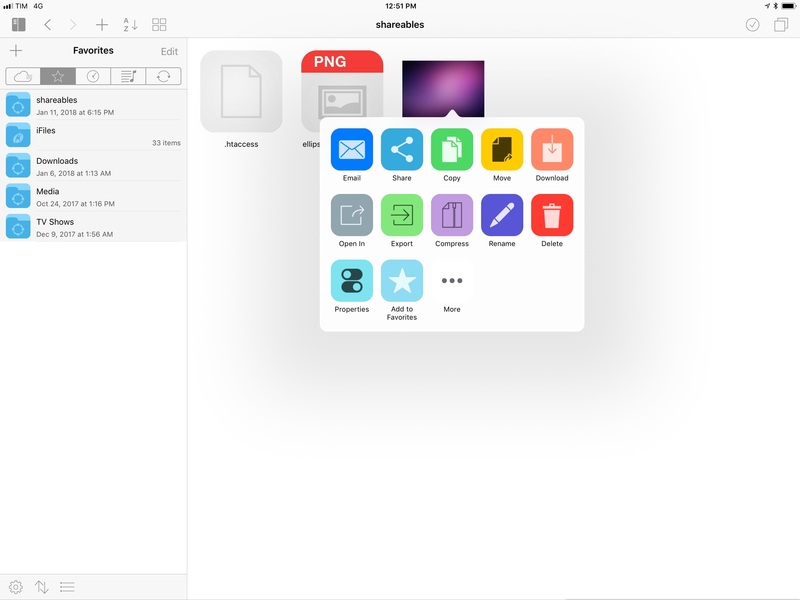 The app can import and export files with drag and drop: to upload a file, just pick it up in any iPad app and drop it into a location in iFiles; to download a remote file into an external app, pick it up from Files and drag it out. I tested uploads and downloads based on drag and drop using Gladys and iFiles, and there isn't a lot to say – this is exactly how I'd expect any file manager to work on iPad at this point. Sadly, iFiles lacks integration with Files as it only ships with a legacy document provider extension that opens in compatibility mode on top of Apple's app. Along with the issues I had with copying URLs, this is the biggest limitation of the app. iFiles doesn't look as pretty as Panic's Coda, but it better caters to my needs in terms of service integrations and customization. I hope the developers can fix the problems with copying URLs as well as extend the app to become a native Files provider. The last app I want to highlight is FileBrowser, which has been around for years as a powerful utility to connect to cloud services as well as local servers such as NAS devices, drives on your local network, or shared directories from other computers in your office. FileBrowser comes in three versions (standard, business, and educational) with the primary difference between standard and business being that business users can browse the contents of a SanDisk iXpand Drive from the app, and set up automatic sync for remote folders. Neither feature is essential for me, so I kept testing the regular version I originally purchased years ago. Of all the apps I tested for this article (including those I didn't include today), FileBrowser is the one with the least appealing design. FileBrowser has a spartan, utilitarian look that reminds me of Synology's DS apps. However, despite its unexciting interface and handful of limitations, FileBrowser is the app I keep using to connect via SFTP to my two servers (viticci.net and my local Synology NAS) thanks to its integration with iOS 11 and thoughtful navigation features. First, the bad stuff. FileBrowser can't change permissions for FTP directories (there is no permissions menu, which both Coda and iFiles have) and, strangely enough, it doesn't have a button to copy the public URL of a file. The app can generate filebrowser:// URLs to reopen specific files in the app4, and it can even add these launchers to the Home screen (like Workflow does), but it doesn't have a simple button to copy the link to a file uploaded to an FTP server. What FileBrowser gets right is support for iOS 11's drag and drop and Files app. With drag and drop, you can import items into FileBrowser (and thus upload them to any configured location) as well as export files from a server you're browsing in FileBrowser. 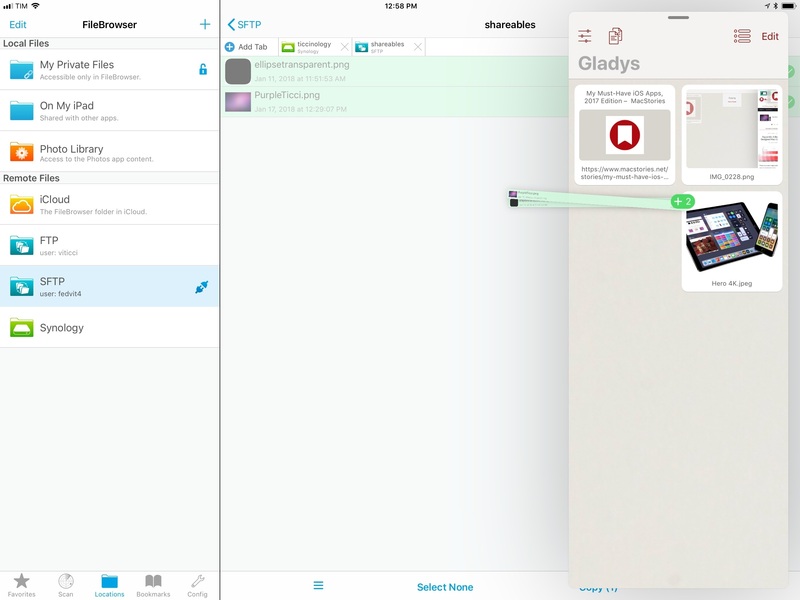 The app supports multi-item drag and drop so you can pick up multiple files in a single drag session and drop them into another iPad app, and it correctly implements lazy delivery (asynchronous transfers) for large files. For instance, I was able to drag a .aif song (30 MB) and a .zip archive (160 MB) from FileBrowser and drop them into Gladys and, while it took a few seconds (particularly for the 160 MB file), it worked just fine; as the file was being copied after I let go of it, I could continue using Gladys as normal. Dragging multiple files from an FTP connection in FileBrowser into Gladys. The best way to integrate FileBrowser with other iOS apps, though, is by enabling its Files extension, which lets you browse network folders previously set up in FileBrowser from the Files app. This has proven to be a great solution for uploading items to an FTP server from apps that don't support FTP but that do offer Files integration. As long as an app can bring up a Files picker, you'll be able to tap on FileBrowser in the Locations area of the sidebar, then select one of your configured network locations. You can access FTP servers in the Files app thanks to FileBrowser. The only caveat is that to use FileBrowser in Files the app has to be connected to the server in the background. However, the Files extension makes it easy to relaunch FileBrowser directly from the error message if the app isn't currently connected to a remote location. Once you're connected (and FileBrowser supports simultaneous connections to different servers) you can keep using the Files extension without interacting with FileBrowser at all. Because Files is integrated everywhere in iOS 11, my Synology and FTP servers are now, by extension (no pun intended), system-wide locations as well thanks to FileBrowser. This is a fantastic showcase of iOS 11's multitasking and Files extensibility, and it's exactly the path I wanted Panic to embark on with Transmit. I can now save FTP sub-directories as Favorites in Files for quick access from any iPad app and, thanks to drag and drop, perform straight-to-FTP uploads simply by picking up a file and dropping into a folder in Files, with FileBrowser acting as the middleman in the background. 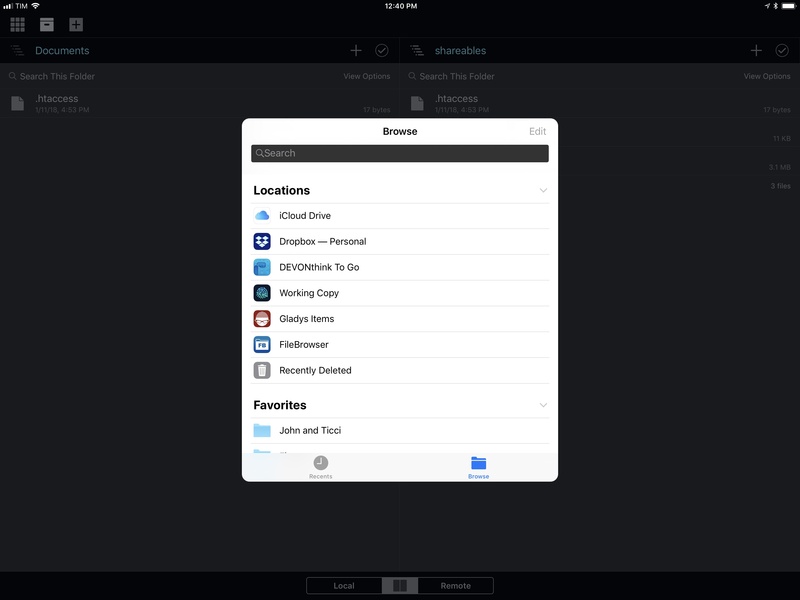 FileBrowser's integration with Files is worth the price of the app alone, and I believe all iPad file managers that connect to cloud services should consider this kind of integration. 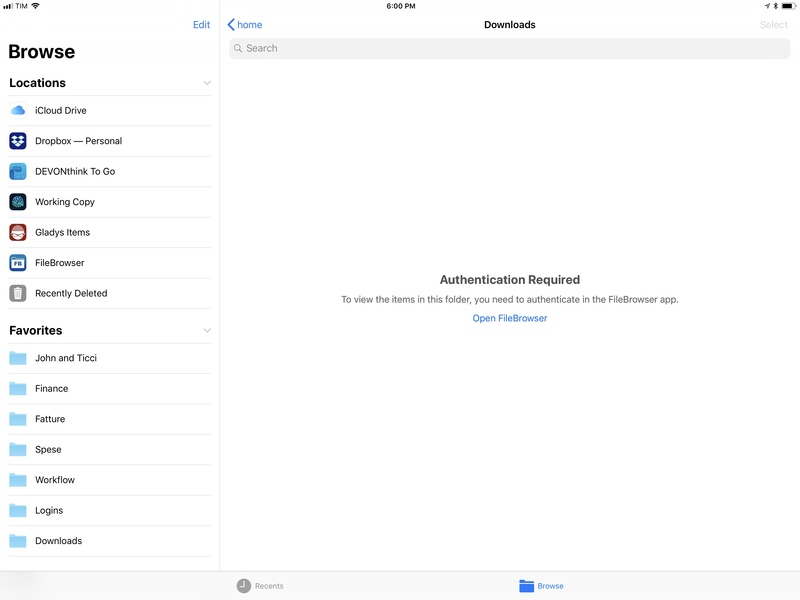 I wish the developers could find a way to authenticate to external services without opening the main app, but it's a trade-off I can accept given the convenience of Files. Finally, I want to mention FileBrowser's distinction of Favorites and Bookmarks. Because the app supports a variety of services and server connections (including passwordless logins with private/public keys), a Favorites view lets you filter your most frequent or important ones without the clutter of the main Locations view. Specific directories, on the other hand, can be saved as bookmarks, which are listed in a popover or in the sidebar. Tapping a bookmark connects to the server and immediately navigates to the saved location, which is a nice way to save time when managing files and folders across multiple directories. None of the apps I covered above are "perfect": each prioritizes different aspects of FTP connections and file transfers, whether it's design, support for dozens of services, or superior integration with iOS 11. Ideally, Transmit for iOS could have been all of this: a file transfer app based on Coda's beautiful design, with support for a plethora of services and iOS 11's latest APIs. For now, I'm keeping Coda, iFiles, and FileBrowser on my iPad Pro because they all serve different purposes. 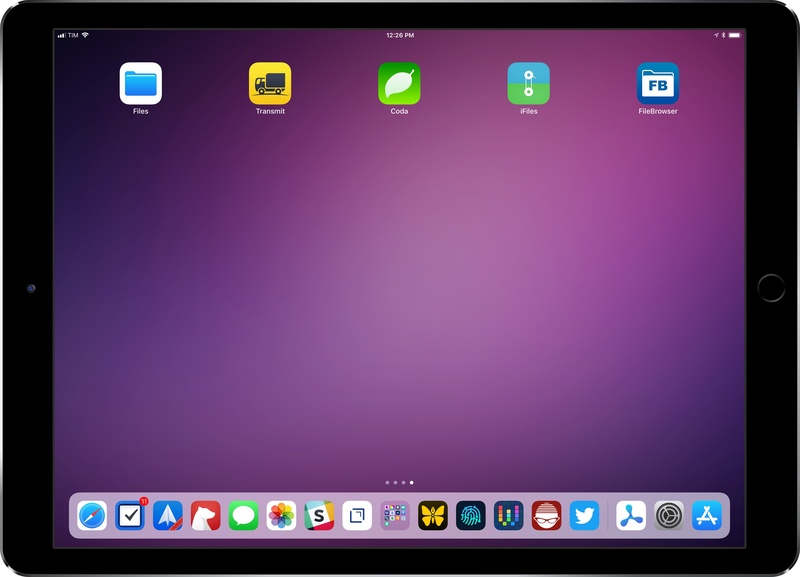 If you absolutely need to pick just one, however, I suggest you ask yourself what aspect is most important for your iPad workflow – there is a lot of overlap between these three apps, but also clear differences in terms of design and functionality. If you know what you're looking for, choosing a Transmit replacement shouldn't be impossible these days. Funnily enough, researching this column made me realize that most of my needs – drag and drop, SFTP/SMB connections, and Files support – could be easily fulfilled by Apple with an update to Files later this year. As it turns out, the company's other file manager – the desktop Finder – has offered all these features for years. I'll probably still have to use dedicated apps for more advanced options, but I'd love the ability to connect to my FTP server and NAS directly from Files in iOS 12.